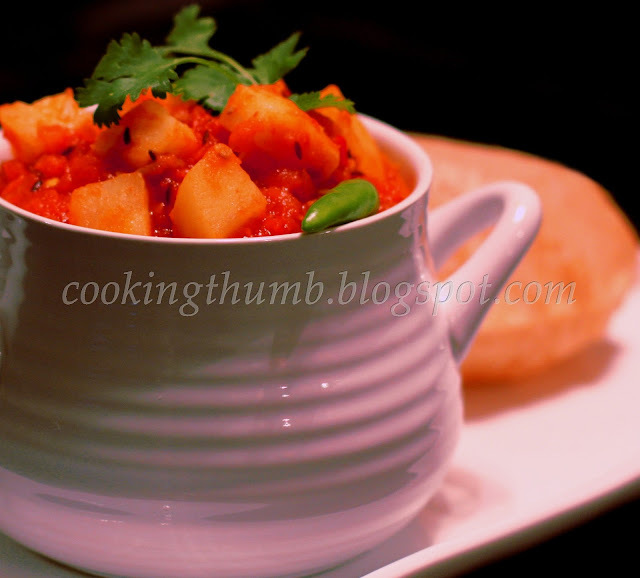 Aloo/Alu Bhaji (Spicy potato curry) is an Indian favorite for its insanely simple preparation and easygoing taste. When served with Puri (unleavened, deep-fried tortilla-like Indian bread), the combination is probably the most universal Indian entree ever. The Puri-bhaji combo can found frequenting Indian breakfast and lunch tables, lunch-time eateries for office-goers, in kids' lunchboxes, during Indian festivals, at Hindu temples as lunch-time Prasad (God's meal offering), and probably most famously - a poorer variant is sold at all railway platforms across North India. I will not be surprised if someone comes up with a statistic someday that Puri-Bhaji is the most consumed meal in India! My family would have contributed mightily to this statistic, nary a Sunday passed without having this delectable pair for brunch. On a personal note, nothing proves the simple irresistible power of this dish to me more than seeing my health-nut hubby sitting down with a pack of paper napkins to swab away the oil from the Puri and have a go at the dish rather than turn it down. Boil water (enough to cover the tomatoes) in a deep pan on medium heat. Add tomatoes & cook for 5 minutes. Drain, cool & peel off the skin. Mash the tomatoes coarsely with a masher. Keep aside. Heat oil in a deep pan on medium heat. Add cumin seeds. Once the cumin seeds begin to change color, add asafoetida. Mix..
Add salt to taste, turmeric powder, cayenne pepper, green chillies. Mix. Add the mashed tomatoes & 1/2 cup of water. Mix well & cook for 10 minutes or till the gravy is thick. Keep stirring occasionally. Add sugar & potatoes. Cook for 5 minutes. Adjust seasoning to your taste. Transfer it to a bowl. Garnish with chopped cilantro leaves. Serve it hot with Puris or Paranthas. Add less sugar if you prefer to keep the Aloo Bhaji tangy. Great recipe. I tried the recipe at home and it was awesome. I followed your advise on keeping the sugar less because I like my curry to be spicey. Keep more recipes coming our way. Thanks. I like it spicy too and less sugar keeps it healthy as well. Certainly will post more recipes - more than happy to oblige.